To Pickle a Tongue. Sprinkle it with Salt, and let it remain till the next day. 1 ounce Salt Petre. 1 ounce brown Sugar, 2 large handfuls of common Salt, a TeaCupful of Treacle and Beer. In 3 Weeks it is fit for boiling. Mrs. Flott. Lay preserved Apricot or Orange Marmalade at the bottom of a Glass, Dish, grate the rind and squeeze the Juice of a Lemon over it. Dissolve 1/2 oz Isinglass in 1/2 pint of new milk, when quite melted boil it with a pint of Cream, and sweeten to your taste. When nearly cold pour it through a sieve. Eves Pudding. A Tea Cup of Bread. 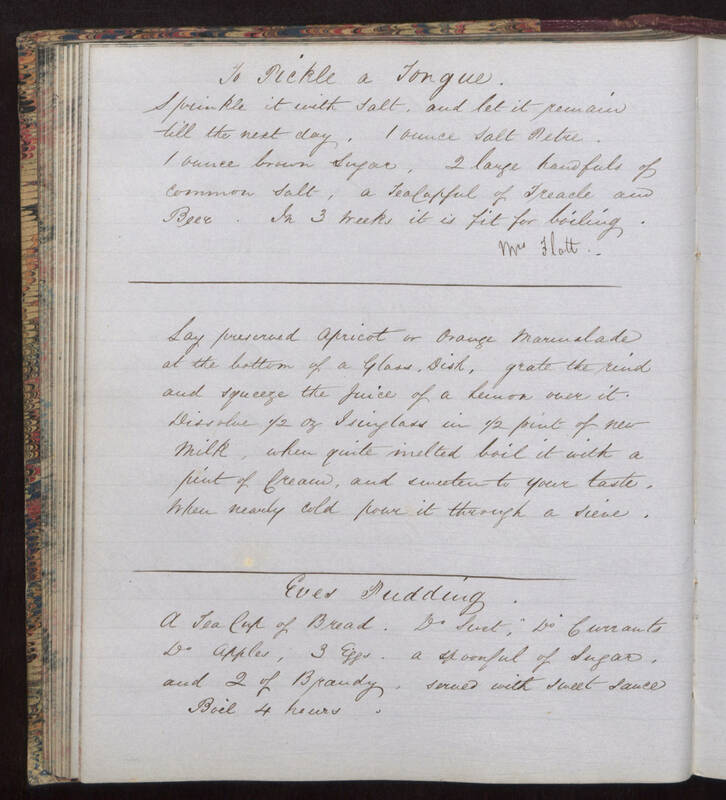 Do Suet, Do Currants Do Apples, 3 Eggs, a spoonful of Sugar, and 2 of Brandy, served with sweet sauce Boil 4 hours.